Our regular menu is available to download in PDF format. 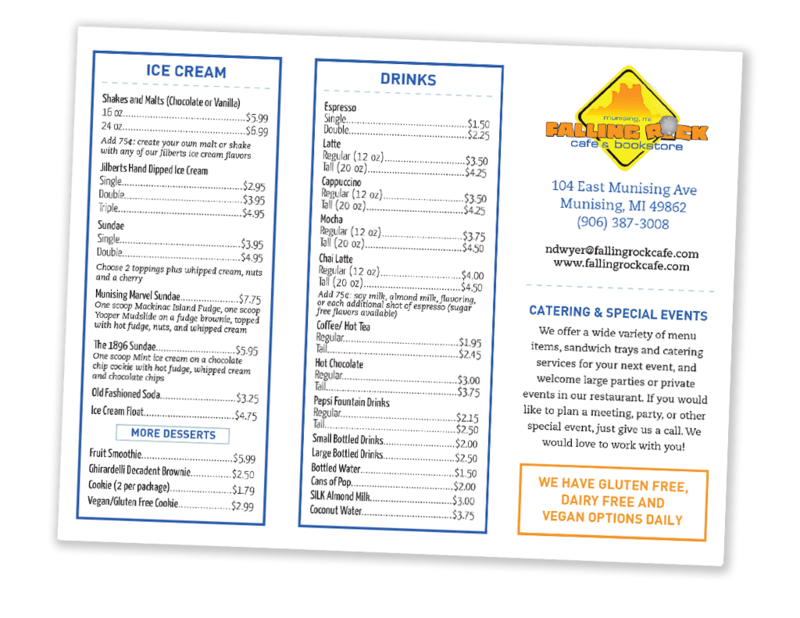 We offer gluten free, dairy free, and vegan options daily. Our mixed berry smoothie is a mixture of blueberries, blackberries, raspberries, yogurt, bananas, and apple juice. There is no added sugar and we do not use any premixed, powdered, or any other artificial ingredients. It is large, thick and filling, and blended on a made-to-order basis. Some people have just the smoothie for a meal! It’s popular with children and health conscious customers, and if you are vegan or dairy free, we have almond yogurt that we can use instead of dairy. This has been a very popular item for years, and we have just added another delicious Tropical Smoothie that is very successful with our taste testers. We think it will be just as popular when we introduce it this summer! It contains mangos, pineapples, papaya, pineapple juice, yogurt, and a splash of coconut flavoring. Our smoked whitefish meals are a trademark of the Falling Rock Café. Some wait all winter to get their favorite smoked whitefish menu item and some try it their first day in town, and then order it every day for the rest of the week! We get the smoked whitefish from 100-year-old local VanLandschoot’s Fish House. We toast your choice of bagel and top it with cream cheese, a large slice of fresh tomato, and generous pieces of just smoked whitefish. Enjoy the crunch of the toasted bagel, the freshness of a juicy tomato, and the smoky flavor in every bite! The favorite choice of bagel is the Everything—which is covered with onions, garlic and seeds—but other delicious choices are the plain or wheat bagel. If you want to stay away from carbs, you can choose the Smoked Whitefish Salad, a dinner size plate of fresh romaine and spring mix greens, red onions, garbanzo beans, tomatoes, cucumbers, carrots, broccoli slaw, and generous pieces of smoked whitefish. The mixture of fresh veggies and smoked whitefish is fulfilling, yet healthy. Both of these give you a taste of Lake Superior that will keep the memory of the largest freshwater lake in the world alive long after you are back home. Known as “The Best Grilled Cheese I Have Ever Eaten.” We use simple and fresh ingredients—that when combined with a healthy dose of Upper Peninsula hospitality and a backdrop of rare & out of print books and local art—this motto/compliment rings true! Whether you choose the traditional American cheese on thick sliced white, a combination of several cheeses on multigrain swirl, or the special pesto and provolone on marble rye, you will not be disappointed. Customers often will take their last bite and walk right back up to the counter and order a second one. TRUE! The Falling Rock Cafe & Bookstore features exclusive blends from Great Lakes Coffee Company. For more information or to purchase coffee for home use please go to our Coffee Page.